Paul Heyman was extreme long before being extreme was cool. Find out how an attorney's son from Scarsdale, New York, became one of the most revolutionary forces in sports-entertainment history. Heyman shoots from the hip, detailing his contributions as a producer, promoter, manager, writer, general manager, advocate and, in his words, "all-around creative genius." 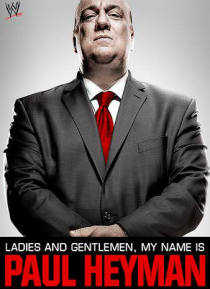 Things are about to get extreme, … and as usual, Paul Heyman's fingerprints are all over it!